Earn up to 4,792 reward points. A comfortable and stylish bass with expanded tone adjustment. 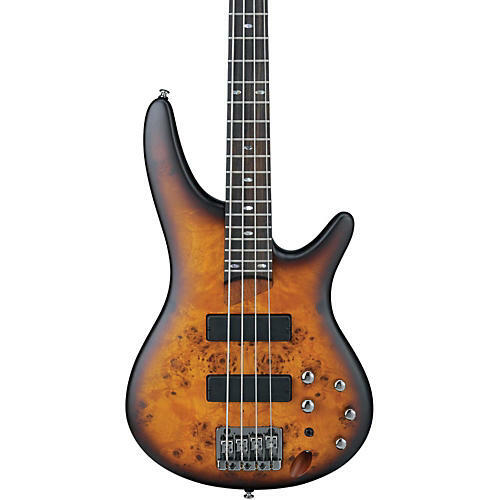 Since 1987, musicians all over the world have come to know the playing comfort and unique sound of the Ibanez SR series bass. With 3-band EQ and its newly developed Mid-Frequency Select switch, the Ibanez SR500 bass can produce any sound you require. The SR500 bass starts with a balanced, contoured mahogany body that's comfortable and resonates well for strong lows and low mids. The SR500's sleek and strong 5-piece SR4 jatoba/bubinga neck is easy to play with just the right width and radius. The smooth curve and beveled styling of the neck joint will also be appreciated when reaching for high notes. The SR500 features an easy-access 9V battery box, powering a Bartolini MK1 3-band EQ. The 2 Bartolini MK1 pickups are split-coil designs that provide a very wide frequency range and enhanced definition for maximum accuracy. The neck and bridge pickups have equal response, like traditional single-coils, but without the hum and noise.